Liz's Paper Loft: Designer's Challenge! Happy Thursday my paper lovin' friends! I just popped in to let you know that over at My Creative Time, some of my design teammates are doing a challenge! You know there are always fun prizes for the winner! So head over to see what this week's challenge is! 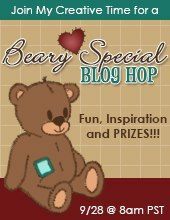 I hope that you will join me tomorrow for the "Beary Special" blog hop!